Marissa Beatty’s career plan sprang from laboratory internships at Michigan State University (MSU), where she currently works alongside researchers who are developing inexpensive, disposable electrochemical biosensors that can detect poison gas and other toxins. Her dream is to land a research job at a national laboratory. Beatty knows she can’t get there with just the bachelor’s degree in chemical engineering she expects to earn in 2017. So she’s working to keep her grades high and prepare for the graduate record exam (GRE) in hopes of joining a Ph.D. program at Berkeley or Caltech. Luke Palguta, fresh out of Catholic University with a biomedical engineering degree, would likewise seem to be a prime grad school prospect. President of his school’s chapter of Tau Beta Pi, the national engineering honor society, he interned at the Harbor Branch Oceanographic Institute in Florida and has both lab experience in nanoparticle research and a semester abroad under his belt. He’d like to venture in a new direction, pursuing either oceanography or optics. But for now he’s looking for work, resolved to retire his college loans before seeking more. If engineering grad school populations are swelling, as many are, it’s mostly due to international students. The number of foreign-born students enrolled in graduate engineering programs almost doubled between 2005 and 2014, reaching 63 percent, ASEE’s surveys show. In some fields, like electrical and computer engineering, the percentage is much higher. While the number of engineering doctorates awarded to Americans or permanent residents has risen sharply in the last decade, more than half still go to candidates from overseas, according to National Science Foundation data. Increasingly, the U.S. students pursuing graduate degrees form an elite cohort. According to NSF, the proportion of doctorate recipients who were first-generation college students fell from more than two-thirds in 1963 to fewer than one-third in 2014. The trend has long raised questions about the long-term viability of America’s research enterprise. Back in 1988, an Institute of International Education report noted that “the very high proportions of foreign engineering graduate students have been of growing concern to policymakers in government and higher education” and said the advantages of an international component in the student body “may well be undermined when the proportion of foreign students is one half or more.” A dozen years later, international students started outnumbering domestic graduate students in physical science and engineering, and have been driving increases in graduate applications and enrollment in most years since. International students now comprise three-fourths or more of some engineering departments, such as electrical and computer engineering at the University of Maryland. According to the Council of Graduate Schools (CGS), mathematics and computer sciences (22 percent) and engineering (10.5 percent) showed the steepest increases between 2013 and 2014. While growth slowed in 2015, engineering “remains the most popular broad field of study for international graduate students,” reports CGS. In part, this is a vote of confidence in American universities, showing that they continue to attract some of the world’s best and brightest – the kinds of students who will go on to senior faculty positions at top universities or commercialize their laboratory discoveries, expanding the high-tech workforce. The downside is that many won’t remain in the United States, either because of improved opportunities in their home countries, U.S. restrictions on immigration, or family responsibilities. “The increase in overall enrollments is good news, but the disparity between U.S. and international growth is a cause for concern,” CGS President Suzanne T. Ortega said in a September 2015 statement accompanying the release of the 2014 enrollment tallies. Projections by the Bureau of Labor Statistics, she noted, show employers adding nearly 2.4 million jobs requiring a graduate degree or higher between 2012 and 2022. At the current rate, U.S. schools won’t be able to meet that demand. The high proportion of foreign-born graduate students “could be a positive, except more and more are leaving,” the retired Lockheed Martin CEO tells Prism. “Our immigration laws are throwing them out of the country.” Also, “universities abroad have improved greatly,” reducing the incentive for foreign students to seek an American degree, Augustine says. As an intern at Dow Corning, the Michigan-headquartered multinational firm specializing in silicon-based products, MSU chemical engineering student Henry Pan noticed that “higher-level positions have people with Ph.D.’s.” One manager in particular made an impression. “She told me that getting a Ph.D. benefitted her in the way she approached problem solving,” particularly when faced with an open-ended challenge. Pan also recognized that a doctorate would give him more freedom to pursue his own projects. Still, his choice of a research career was initially difficult, since he knows graduates in his field are in demand. Even if he doesn’t get the one-year Churchill scholarship to Cambridge University for which he’s been nominated, Pan says he plans to seek a chemical engineering Ph.D. and either enter academe or join a start-up. Much of the growth in engineering graduate enrollment, accounting for what CGS calls “a large majority of first-time international graduate students,” has occurred in master’s and professional certificate programs. Computer, information sciences and electrical engineering are among the most popular fields. For engineering schools, this is a revenue boost. Most master’s students pay full tuition; international students at public universities pay higher out-of-state rates than do in-state students. As a result, many schools actively recruit overseas. One is the University at Buffalo (UB), a State University of New York campus, where international students pay upwards of $40,000 per year and represent about a third of all graduate students. Sarthak Bhat, from Bangalore, India, had to borrow money to attend but expects that his U.S. master’s degree in computer science will mean “a very big leap” in employability back home. “If I had to choose a country for my computer science master’s, it would be the U.S., based on the number of companies and start-ups here. It’s just really good exposure.” His parents funded his undergraduate study of telecommunications at Bangalore College of Engineering and Technology, after which he spent two years in industry. He has lined up a job with Amazon that will help pay off his loan. As a science, technology, engineering, and math (STEM) graduate, Bhat is eligible to work in the United States for 29 months. Then he plans to return to India, where most of the tech companies and “a lot of computer science start-ups” have established footholds. While Kettering recruits abroad and domestically to expand its master’s program, newly minted mechanical engineering graduate Amy Allison has opted to accept one of three job offers rather than rush into grad school. She’ll be joining General Motors as an engine calibration specialist, working on 5.3- and 6.2-liter trucks and SUVs. Her salary, in the “higher range for mechanical engineers,” will help pay off her college debt. “It came down to my potential for growth,” says Allison, who looks forward to the hands-on work and learning from others as part of a team of 17. Grad school is not out of the picture, however. GM partners with a number of universities, including the Massachusetts Institute of Technology, which offers a Leaders for Global Operations master’s that combines engineering and management. Allison could apply after three years on staff. “My hiring manager definitely emphasized GM’s support for graduate studies,” as well as patent filing and presenting at conferences, she says. Persuading more industry engineers to return to campus could be one way to boost the number of U.S. graduate students. Indeed, some educators argue that the combination of real-world experience and the research skills and theoretical background that come from advanced training are just what the country needs. Yet while employers such as GM see a benefit in graduate study and grant their engineers time to pursue it, job and family demands often prove barriers. “It’s easier now than later,” ASU’s Anderson-Rowland, an associate professor of industrial engineering, counsels undergraduates. “Stay a little poorer for a year or two.” She knows of a company where 14 employees returned to school for a master’s, and only two finished. “It’s too hard.” In 2002, Anderson-Rowland began the NSF-backed Collaborative Interdisciplinary Research Community (CIRC) program with the aim of increasing the number of women and minorities – many of them transfers from community colleges – pursuing a graduate engineering degree. CIRC, which has evolved over the years, combines a stipend for undergraduates, instruction in study habits and time management, research orientation, a support network, guest speakers that include a graduate-student panel, and how-tos on applying to and getting funding for graduate school. 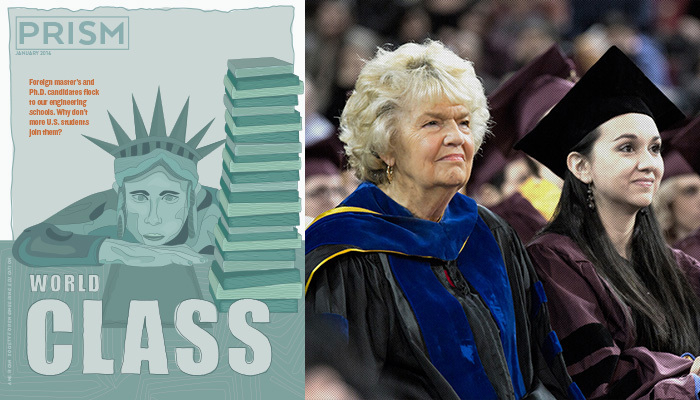 She stresses the fun part, telling students: “I personally had way more fun in graduate school than undergraduate or high school.” Thirteen years later, CIRC now boasts a 95 percent graduation rate, with half of its undergraduates going directly to grad school – more than four times ASU’s overall rate. Part of Anderson-Rowland’s job is to dispel false impressions of graduate education. “Students think that a higher degree will take them out of the competitive salary market,” she explained in a 2015 ASEE conference paper. Many also think the only reason to consider graduate school is to become a professor. In fact, she tells them, “go-getter companies” now demand engineers with higher degrees and are prepared to pay $10,000 to $15,000 more in starting salaries to get them. Intel’s Engineering Leadership Program illustrates the point. Seeking “outstanding technical problem solvers who are excited to lead,” the website adds that candidates must have either a Ph.D. in engineering or science, “a research-intensive master’s degree,” and/or relevant industry experience. Many of Anderson-Rowland’s students are first generation. But judging from NSF surveys, students like Marissa Beatty and Henry Pan are more likely to fit today’s Ph.D. profile. Beatty’s father has a master’s in engineering; Pan’s father, an international student from China who earned a Ph.D. here and stayed, is the noted Wayne State University biologist and vision expert, Zhuo-Hua Pan. While master’s students typically pay full freight, Ph.D. candidates can expect some or all of their costs to be covered by teaching and research assistantships. Some schools won’t admit doctoral students they can’t support. Since significant amounts of research are funded by the federal government, the U.S. taxpayer is paying to train researchers and instructors from overseas. Some will gain sponsorship and permanent residency, joining the historic flow of talented immigrants who add vibrancy and innovation to the U.S. work force. “I do think there is some of that,” Elliot Douglas, a program director in NSF’s Engineering Education and Centers division, says of faculty attracting students with similar backgrounds. “Because the relationship is so important, you do need a good working relationship and a style that you’re going to be compatible with.” That, in turn, holds the potential for international graduate students to follow the same academic path as a mentor. National security restrictions, in particular the International Traffic in Arms Regulations (ITAR), limit the number of international students in sensitive fields such as aerospace, since government grants often require researchers to hold a security clearance. But such is the need for talented advanced technology researchers that the White House and Pentagon in recent years have looked for ways to gain the benefit of foreign scientists and engineers. At the same time, high-tech companies have pushed lawmakers to let more international students with advanced STEM degrees remain in the country. While there’s no silver bullet to produce more American engineering grad students, Anderson-Rowland’s work at ASU shows that the right incentives and support can be persuasive – starting with funding. “Industry needs to get involved in education more,” she says. “They need to put up more scholarships. When you hire an intern, pay for a $5,000 scholarship.” At Maryland, Pines urges faculty members conducting NSF-sponsored research to seek Research Experiences for Undergraduates supplements. REU has been shown to get undergraduates excited about research and to provide tools that can serve them well in graduate work. “If more funds went to REU, more U.S. citizens would benefit,” he says. More companies also could join organizations such as the GEM (Graduate Education for Minorities) Coalition, in which firms provide internships and tuition. GEM picks 100 fellows annually from an applicant pool of 1,000 and “could easily support another 100,” Pines says. States also need to step up and reverse budget cuts that have pinched faculty salaries, says Augustine, who has long championed increased federal research funding. That won’t change the fundamental equation, however. Until college costs come down or industry demand slumps, most U.S. undergraduate engineers will still opt to pursue a paycheck over an advanced degree. Mark Matthews is editor and Jennifer Pocock is assistant editor of Prism.